Free Press, New York, 2006. 364 pages. I'm starting to be amazed at how the exactly right book keeps coming into my life at exactly the right time. It makes sense. God of course knows me, and knows that the easiest way to get a message to me that I need to hear is to send it my way in a book. So I'm calling them my “current book from God.” As soon as I finish one, another comes my way. With this book, as soon as I'd gotten about a third of the way through, I liked it so much, I decided to order myself a copy, so I could go through it slowly, doing all the exercises. My emphasis on healing, growth, and empowerment means that you will not see in these pages lengthy checklists of behaviors that qualify you as a victim or lengthy descriptions of resentful, angry, or abusive men or explorations of how bad they are. You know better than anyone else that your relationship has put thorns in your heart. You don't need a description of how much they hurt or how bad it is for you to keep them. You need to learn how to take them out and how to heal the wounds in ways that prevent scarring. Checklists and bullets about the behaviors or attitudes that qualify as resentful, angry, or abusive would distract you from your most important task. The true issue at stake is your core value--the most important things about you as a person--not his behavior or your reactions to it. As you reinforce and reconnect with your core value, you are far less likely to be a victim. As you experience the enormous depth of your core value, the last thing you will want to do is identify with being a victim, or with the damage or bad things that have happened to you. In your core value, you will identify with your inherent strengths, talents, skills, and power as a unique ever growing, competent, and compassionate person. You want to outgrow walking on eggshells, not simply survive it, and you do that only by realizing your fullest value as a person. The renewed compassion for yourself that you learn in these pages will lead directly to a deeper compassion for your resentful, angry, or abusive partner. . . . You may be able to stop walking on eggshells and walk into a deeper, more connected relationship with a more compassionate, loving partner. It might not seem so now judging from his attitudes and behavior, but your husband wants that as much as you do. If you were to ask, he would probably tell you that deep in his heart he wants to be a compassionate, loving husband, even if he'd blame you for why he isn't. These are huge promises. But reading his methods for transforming your own resentment into compassion, I am convinced that they can work. This is truly about overcoming evil with good. Now, his solution for a resentful husband is for him to read the "Boot Camp" section of this book. Though that might not be feasible, you can still use the techniques yourself to not react to blame and resentment with your own anger and resentment. As Steven Stosny says, "Compassion directly activates your core value--the most important things about you. In your deepest values, you act with conviction and strength. Compassion is power. "If you give up resentment and choose instead to be compassionate, there is no question that you are going to feel better and more powerful than if you vow to make him pay for whatever he's done. What's more, Dr. Stosny has specific techniques, with the acronym HEALS, to teach you to react to a core hurt with compassion rather than with anger. I'm only beginning to practice it, but I'm already very impressed with it. This is so much better than getting angry and storing up retorts or ways to get even. Compassion and forgiveness are better for your body and soul than resentment and blame. He isn't talking about being a doormat. Love him enough to recognize that his hurting you is killing what little sense of adequacy as a husband he has left. Love him enough to demand that he find it in his heart to value and respect you, according to his deepest values. He seriously violates his deepest values when he fails to value and respect you.... Every time he says a harsh word to you or gives you the cold shoulder, or simply fails to value and respect you, he hates himself a little more. 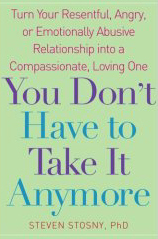 This book doesn't promise it will get your spouse to change. It advises you, "Focus on what you can control--your ability to improve, appreciate, connect, or protect--rather than what you cannot control, such as the opinions and behavior of your husband." If you're having trouble feeling worthy of love, Dr. Stosny tells the secret: "Here's the hot and hard truth: Only your own loving behavior can make you feel worthy of love. It's not rocket science. The only way to feel lovable is to be loving and compassionate." And he helps you learn to do that. This is a wonderful book. I highly recommend it to anyone who's ever felt any resentment toward anyone! I also ordered from Amazon two other books by Steven Stosny that teach the HEALS technique, Manual of the Core Value Workshop, and The Powerful Self. I want to learn these techniques, because I believe that they will make me a more compassionate and forgiving person, as well as a much happier person. As Dr. Stosny says, "Whether or not he changes, you must connect with your enormous inner value, resources, and personal power to stop walking on eggshells and to emerge as the richly creative, beautiful whole person you truly are." You can learn more about Steven Stosny's work at the website www.compassionpower.com. December 15, 2007--With the paperback version, it appears that Dr. Stosny has renamed this book to Love Without Hurt. I like the new title a lot! It reflects the content of the book better--compassionate, not combative.